Honolulu has excellent travel and transport options, including bus services and taxis are always readily available. The city's good roads make traveling to the outlying attractions outside of rush hour quick and easy. Due to the island's remoteness, flying to Honolulu is the only viable option for gaining entry to the Hawaiian Islands. Honolulu airport is a major Pacific hub and flights arrive from major cities all over the world. 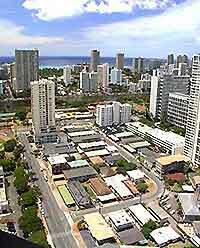 Reliable and frequent bus services and taxis run to Waikiki and Honolulu's hotels throughout the day. 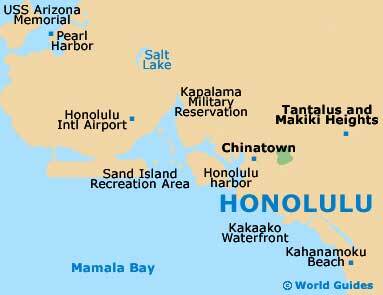 Honolulu International Airport is Hawaii's major airport and lies around 4 miles / 6 km west of Waikiki. Most flights from the US mainland depart from both Los Angeles and San Francisco and there are also direct flights from London. 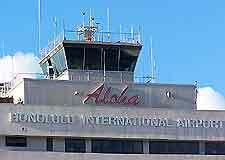 Interisland flights also arrive and depart at the airport's Interisland Terminal via Aloha and Hawaiian airlines. 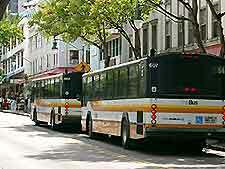 A free bus service operates between terminals and taxis and shuttles run services to the city throughout the day. For further information, please refer to the Honolulu Airport page. Honolulu International Airport has offices of all major car rental companies and customers who have pre-booked a vehicle will be met by a representative outside the baggage claim area, and then taken to the car lot area. There are three main highways on Oahu, with Highway 1 running west-east from beyond the airport on to Honolulu and then Diamond Head, while Highway 2 runs from near Pearl Harbor (linked with Highway 1) farther into the island and Highway 3 goes to Kaneohe Bay in the east. The journey time from the airport to Waikiki is about 20 minutes via Highway 1 and Kalakaua Avenue. Renting a car can be an economical way to travel around the Honolulu area and most major car rental brands available online. Book your Honolulu Car Rental here. The municipal bus service, 'The Bus', travel from Honolulu International Airport to Waikiki for a minimal cost, although passengers are only allowed one bag each. Bus services also run frequently to the various Honolulu districts throughout the day and circle the island. Shuttle services run 24 hours per day and to any of Waikiki's hotels from Honolulu International Airport for a nominal charge. Taxis pick up from the airport's baggage claim exit and have a standard start up fee, charging by the kilometer for travel thereafter. A trip to Waikiki from the airport is relatively inexpensive, while each suitcase will incur an extra charge. Taxis are also available at a number of the larger hotels in Honolulu and can also be flagged down on the street, although a small charge is made for this. Hawaii's island of Oahu contains more traffic than the other islands, making cycling a particularly appealing way to travel in Honolulu. A number of bicycle rental shops are situated in the center of Honolulu and maps of popular cycle routes are available at the HVCB Visitors' Information Center in the Waikiki area of Honolulu.